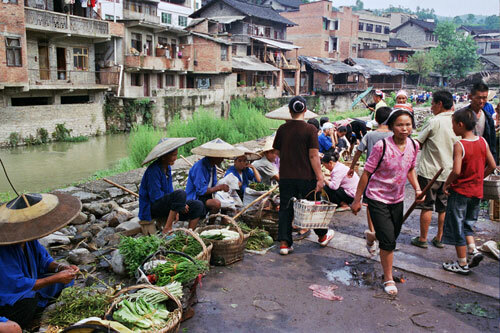 Like the huge Sunday markets in Anshun and Rongjiang, Chong’an market is a farmers’ market, not a place to pick up souvenirs, but an excellent spot for people watching and soaking up the atmosphere. We got there pretty early, when things were just starting to kick off. 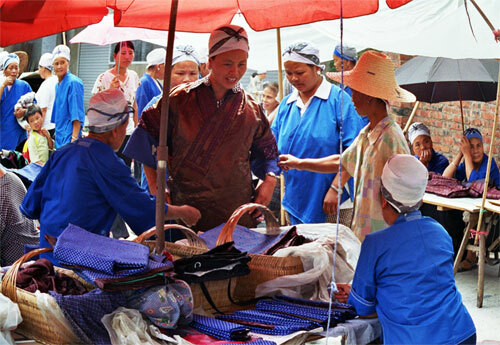 Throngs of Miao, dressed in blue tunics and black trousers and wearing huge straw-hats over small white caps, or curious, shiny turbans of a brown, metallic material, were pouring into the market area from all sides. 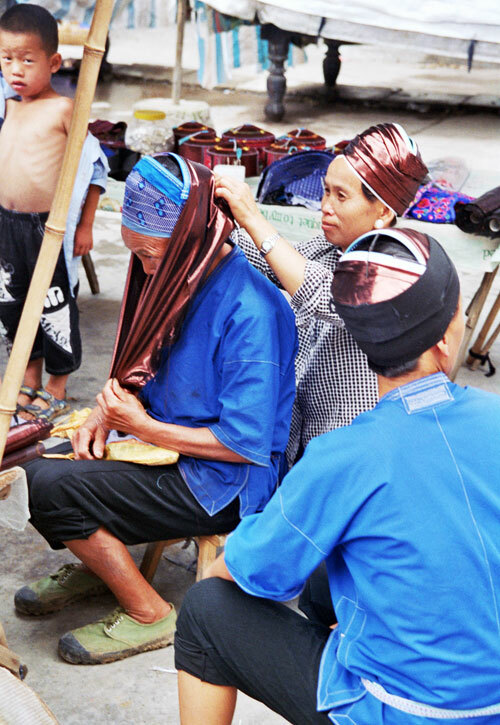 They were accompanied by the occasional Gejia lady, distinguishable by her multi-coloured hat with pointy side-wings and embroidered apron. 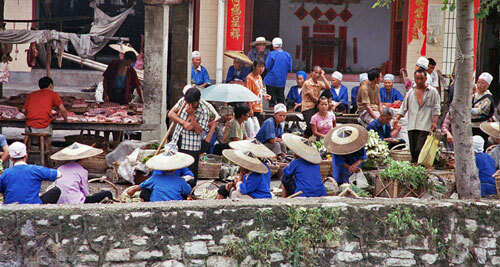 The men came dressed in simple farming clothes and with the same conical straw-hats. 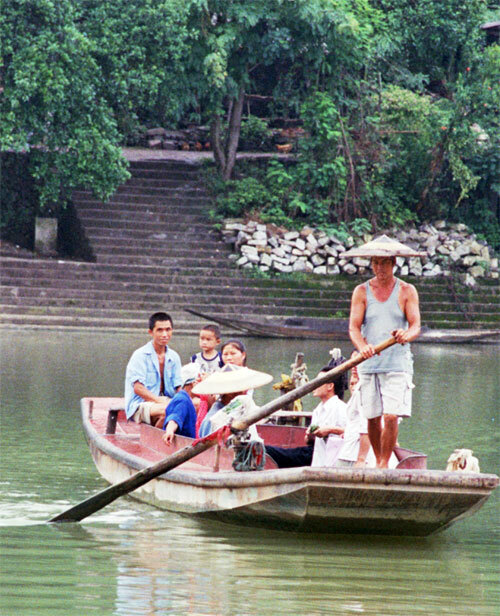 Some of the villagers were ferried across the river to the market, while others had come over on a wooden suspension bridge, a few kilometres down-stream. 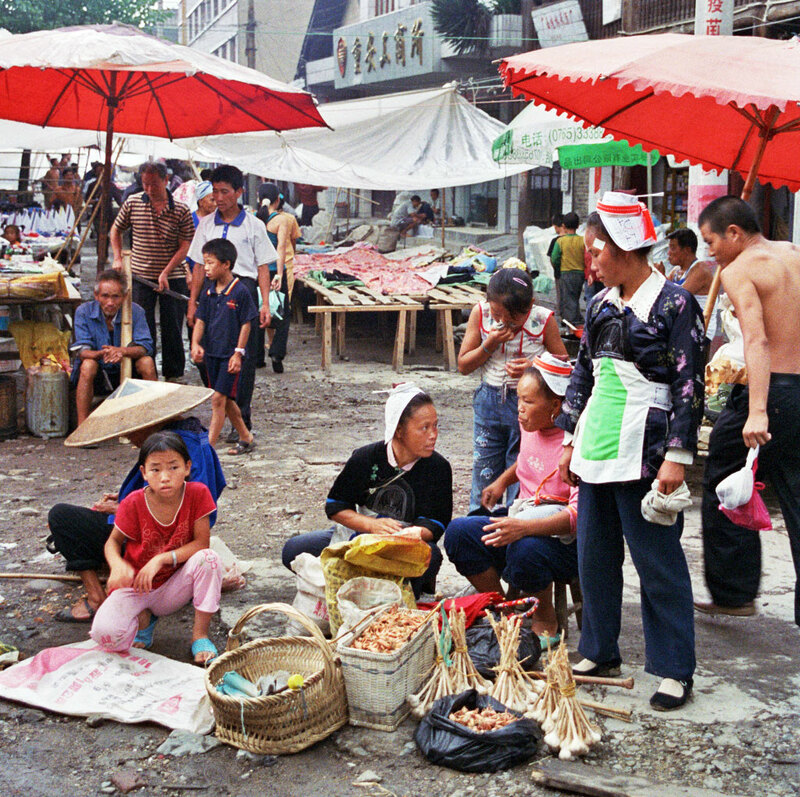 The market is divided into sections. 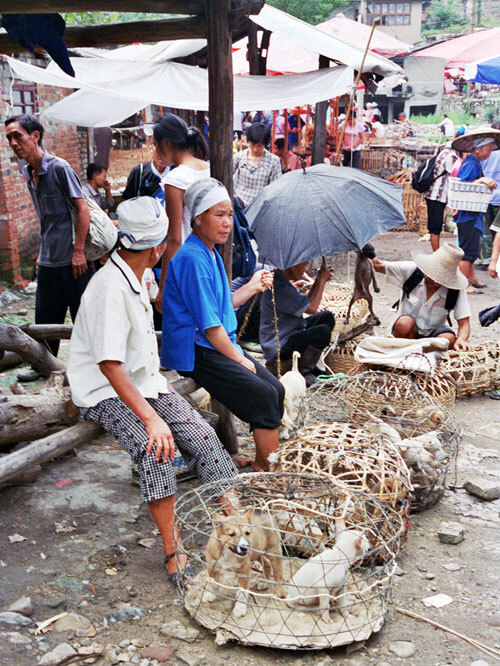 The animal market has plenty of livestock about to meet their maker. Chickens, ducks and other poultry, as well as cute fluffy puppies, are all displayed in bamboo coops, waiting for potential buyers/ consumers. 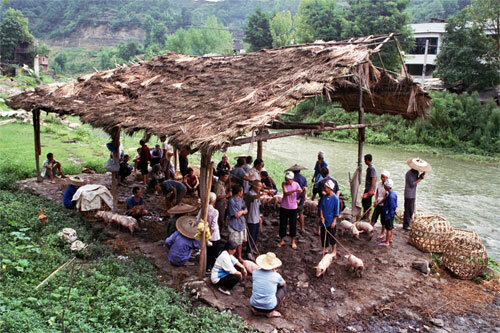 Piglets are sold underneath a wooden shack down by the river. 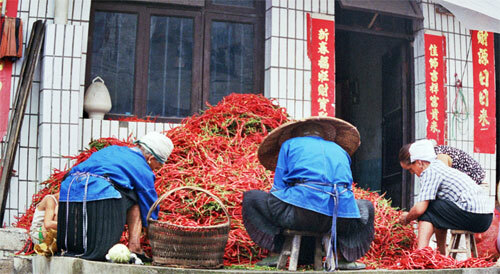 Among the vegetables, the huge section devoted to chillies shows just how important these fiery red peppers are in Guizhou cuisine. 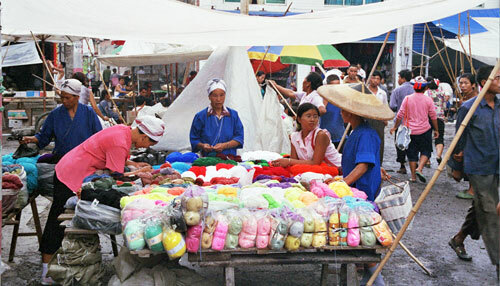 A special feature of the Chong’An market is the cloth and hat section, where Miao ladies make and sell their distinctive turbans. You can see them fitting and wrapping the heads of their customers, trying out different styles. 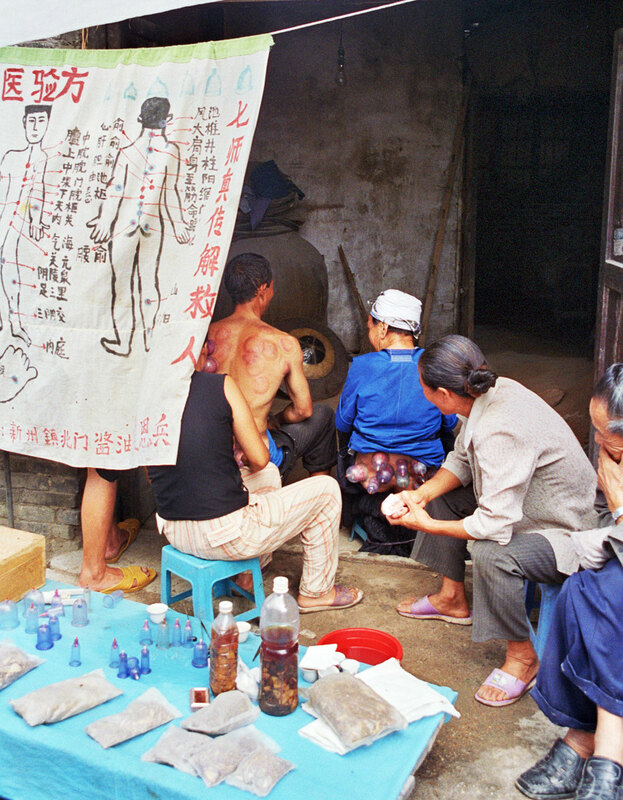 In another area people receive treatment in Chinese medicine: cupping seemed to be especially popular. This is a method which consists in placing heated glass cups over determined energy parts of the body, so that the suction unblocks those areas where the energy has been obstructed, allowing this vital energy, or Qi, to flow through the entire body again. This in turn helps the organism fight toxins and recuperate its health. 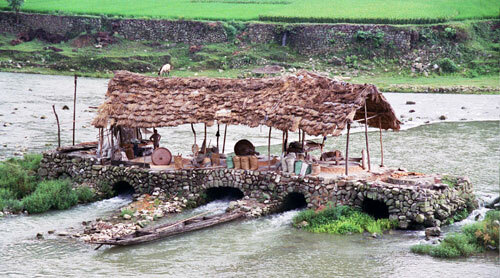 In the middle of the river you can see some grinding mills still powered by the river’s current. 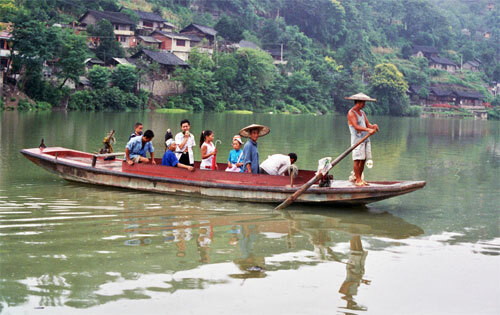 Boats travel to and fro to to deliver raw goods and and collect the finished product. 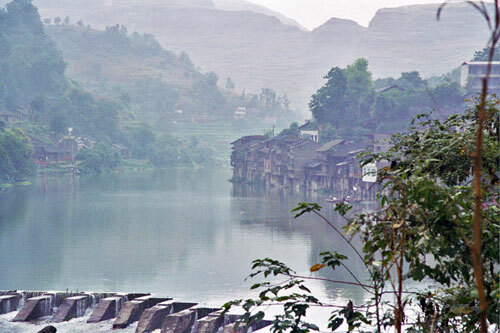 Coming and going: We visited Chong’an from Zhenyuan in a car we had hired. The trip took about two and a half hours as we stopped at a few places on the way and back. 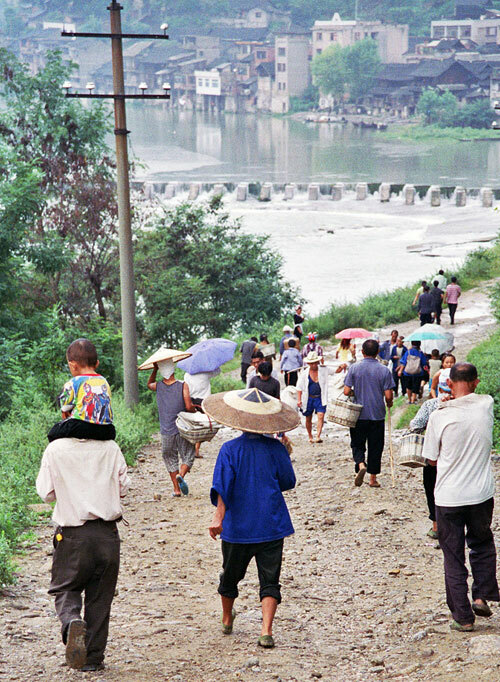 However, if you are using public transport, then it is better to travel from Kaili, from where regular buses leave throughout the day. Accommodation: We saw a couple of nice and simple guesthouses with signs welcoming foreigners near the wooden suspension bridge. 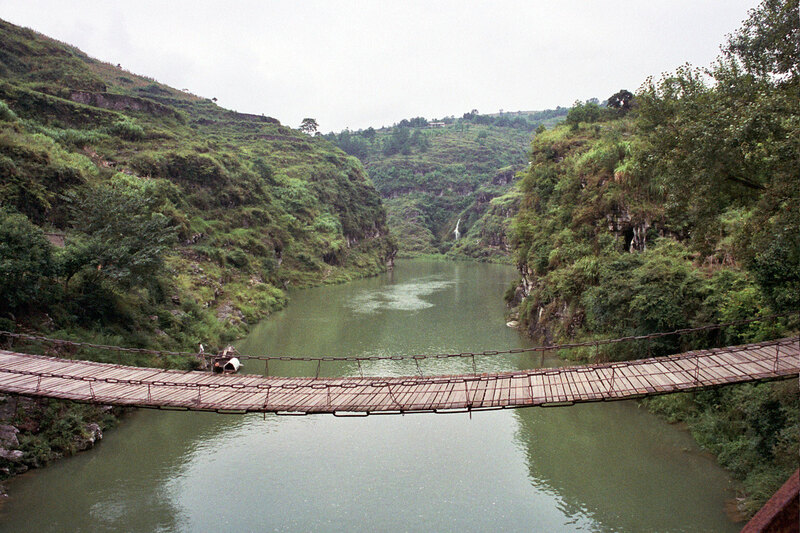 Near this area there are also a number of interesting looking paths leading off into the green hills, towards other Miao villages. 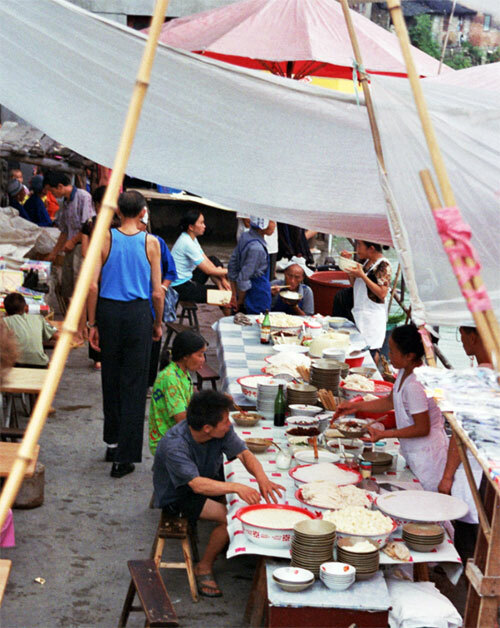 Food: There is a food ally in the market, selling noodles and other simple dishes. 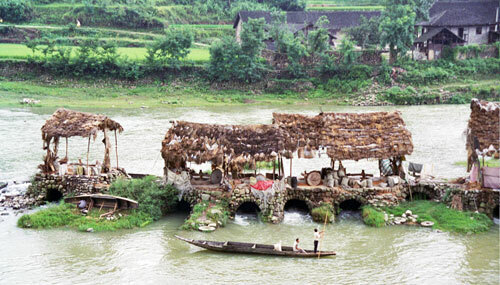 The other speciality here is, as in most Guizhou small towns, dog hot pot. 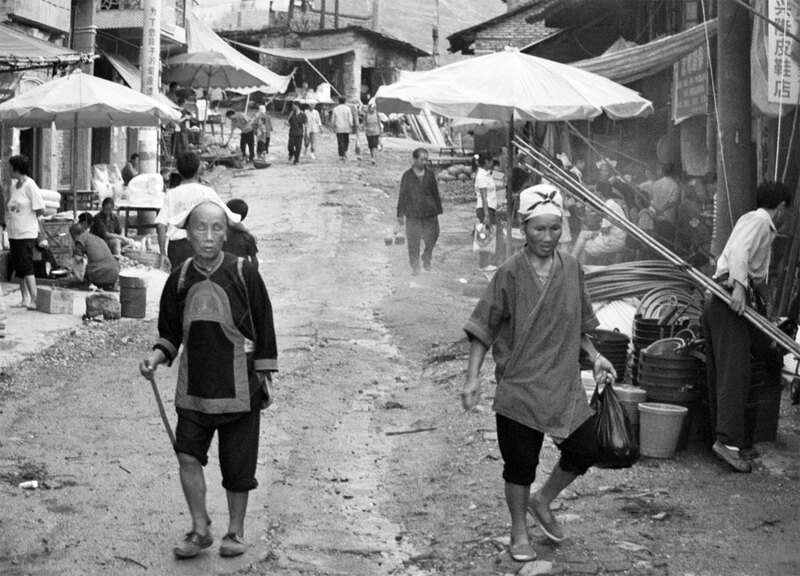 All reports say the Chong’an market is still a fascinating market to visit. 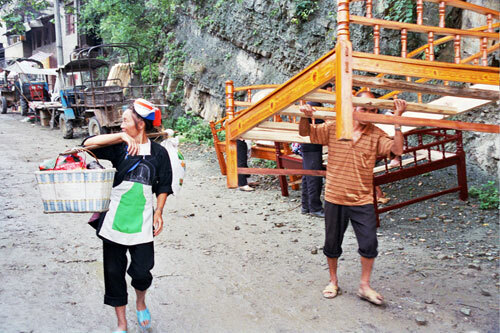 Roads improvements mean that it is far more accessible from Kaili and Zhenyuan than it was.